If you are like me, you just enjoy making individual portions of food. By this I mean making mini versions of big things. Rather than baking a tart, I usually prefer to make tartlets. Maybe because I find them cuter (and girls like cute, don’t they?) or because it reminds me of our visits to Spain with its tapas which I could have literally every day. In any case, cooking mini “things” helps me to better determine how much is needed for a meal with guests since I count according to the number of tartlets. You surely do not run into the issue of messing damaging the dish while cutting. It stays cute! Last week, I decided to make mini filo tarts because I had some filo pastry left that I needed to use. I usually use frozen filo pastry hence always need to make sure I will have a good supply of ideas to use what is left. I had come across this recipe many many years ago, after going to Avoca Café in Dublin, Ireland. I had loved the place right away – mind you, any place with brown bread is sold to me!- and of course, bought their cookbook, Avoca Café Cookbook, which I used to make this recipe. This cookbook offers a great variety of recipes for soups, breads, salads and traditional Irish cuisine, well documented and accompanied by lovely pictures. 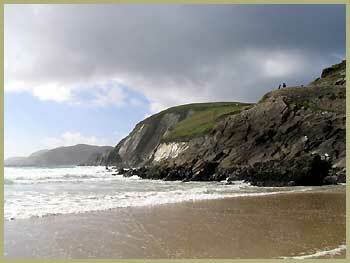 And in short, if you ever go to Dublin – P’s home – make sure to stop at Avoca Café. They do have different locations across town and I find it an ideal easy place for lunch. Of course, I just drool at the thought of brown bread! 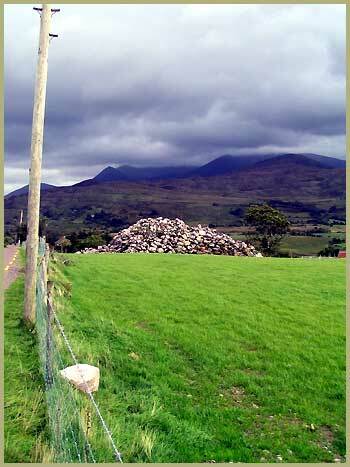 Or those landscapes from our trip to Ireland in Sep. 2004. Did I say that in New Zealand, you could recognize Irish lanscapes? One of the ingredient which adds a lot to the dish that follows is the groseilles (red currant). Although the recipe asks for cranberries and adds it as optional, I would not only use groseilles instead but not ommit them since the taste of all ingredients together is enhanced by the acidity of the groseilles. This fruit belongs to the family of red fruit (in French we refer to this family of fruit as les fruits rouges) and is often used to make jams and tarts. As long as I remember, my mum, grand-mothers and aunts have always kept big bushes of groseilles in their gardens, and today, I keep a great memory of summers spent picking them to make all sorts of preserves. I miss this activity today, but really hope to be able to do it again in the future. I made some changes to the recipe according to my taste, but the main idea remains the same. Preheat your oven at 350 F (180 C). Grease a muffin pan (for 6). I have a silicone one but any muffin pan is fine. 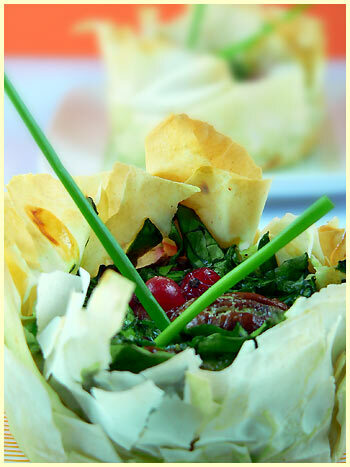 In each mold, place 2 to 3 layers of filo pastry cut to match the size of the mold and each time, brush the filo pastry with olive oil. Wash the spinach and cut it coarsely. Mix together the spinach, cheese, pecans and red currants. Divide between each mold. Beat together the eggs, egg yolks and the cream. Place in the oven for about 25 mns. 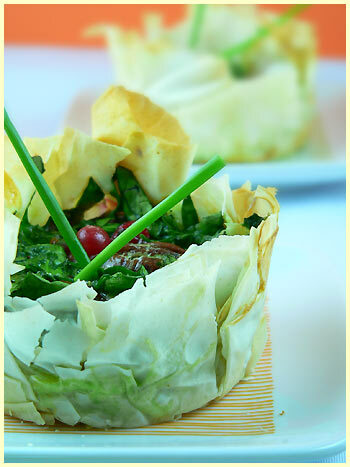 Check regularly as the filo pastry cooks quickly and you do not want it to burn. 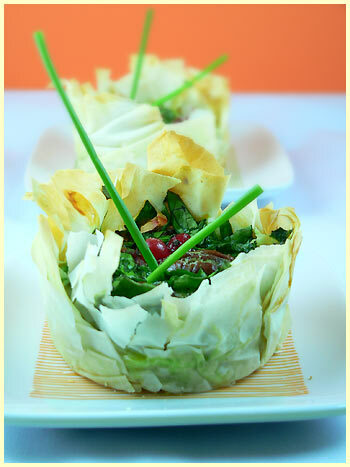 This is delicious on its own, as finger food or for a light lunch with a salad. I recognize those plates 🙂 You’ve clearly put them to very, very good use! These put me in the mood for spring! Love the French name, it somehow seems tastier than the English one. delicious! i wish i could press a button on my keyboard and eat one right now. and your photos are unreal as usual. i love these tarts. i am tempted to add some chunky pieces of feta cheese also. will definitely try these in the coming weeks and report back. i love your blog, the photos are absolutely wonderful. Looks so springlike and light Bea! And lovely Irish pics! Your photos are always so lovely. 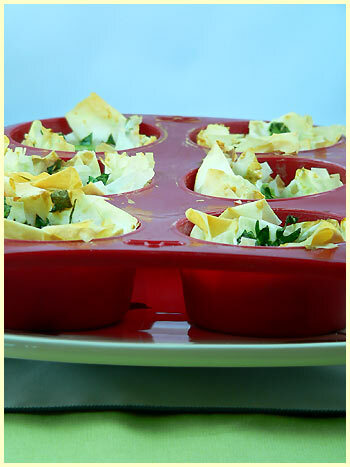 I made the same kind of things with filo sheets in bowls but I have never thought to use muffin pan. Merci pour l’idée. géniale ! You photos are always so amazing ! 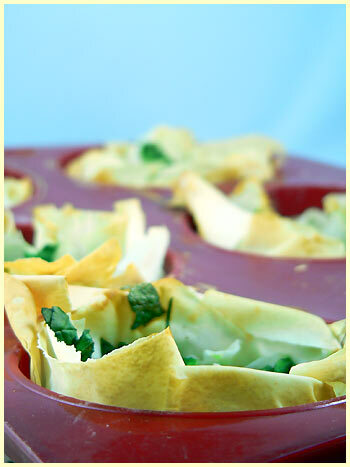 I made the same kind ok thing with filo sheets but with bowls. I’ve never thought to muffin pan and it’s a wonderful idea ! thks ! génial ! This recipe is fantastic, and Irland’s photos are amazing … And now I’m hungry …. Hi Kat, thanks once more! Ah yes, thanks to you and your great taste, I got to know about those lovely plates! Merci! Tankeduptaco, ah ah, funny, I guess it sounds different for sure! Easily Pleased, thanks for the compliment! Don’t get too close to your screen though, I don’t want you sick! Saffron, Yes feta is a good idea, but then don’t put blue cheese. I am glad you are enjoying my blog. Yours is very charming I must say! J, thanks for the note! I fully agree, small portions makes it much nicer and personalized, my favorite versus the bigger version, also more delicate I think. Fabienne, I hope you are well fed then tonight! Béa, Vous etes trés artisque!! These look fabulous! I love Groiselles in everything…when are you going to write a cookbook? c’est absolument superbe et tu fais des émules chez Papilles et Pupilles! bravo ! Béa tu n’as pas mis quand est ce que tu mettais les noix de pécan ? Peux tu préciser si tu les mets avant la cuisson ou si tu les rajoutes après.